Brazen thieves stripped almost £5,000 worth of lead from the roof of an army museum, just hours before a huge celebration took place to mark the regiment’s 50th anniversary. 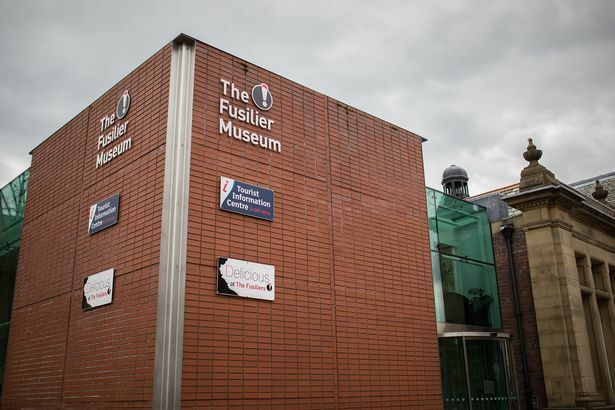 Bosses at the Fusilier Museum in Bury are now appealing for the public’s help after the ‘heart-breaking’ daylight theft. They’ve launched a crowdfunding drive to help repair the damage at the museum, which is run by a charitable trust and is not insured against vandalism. Staff discovered the theft when they opened up the museum in the town center on Sunday morning. It’s believed the thieves loaded the lead onto a van while police and staff prepared for the parade. Later that day hundreds of spectators lined the streets of Bury to see veterans and serving soldiers march through the town center to celebrate the 50th anniversary of the Royal Regiment of Fusiliers’ formation. Museum general manager Helena Briden said everyone involved with the museum was devastated by the theft. It’s thought the thieves may have posed as workmen and climbed up scaffolding, put up to allow repairs to take place to the museum roof. Helena said: “It’s absolutely brazen. We think it was done in daylight, either early evening on Saturday or at dawn on Sunday as it would be impossible to strip the lead in the dark. “Then we think on Sunday morning they’ve loaded the lead into a van while there were policemen and lots of people around getting ready for the parade. “It’s heart-breaking. There’s no other word for it. “I came into work really excited on Sunday looking forward to taking part in the festivities. And the parade and the church service was amazing, but the theft did put a bit of a dampener on things. Helena said in recent weeks the museum, with help from businesses, a donation from the Masons and assistance from the regiment, had forked out for repairs to the roof and a new heating system. It meant staff was now hoping the public would help pay to replace the stolen lead. “Any donations, no matter how small, would be so, so helpful to the museum,” added Helena. The Royal Regiment of Fusiliers was formed in 1968 by the amalgamation of four Fusilier regiments, including the famous Lancashire Fusiliers, and recruits from across Greater Manchester. Since the regiment’s formation, the Fusiliers have seen service across the world, including in Northern Ireland, Cyprus, the Balkans, the Gulf, and Afghanistan. They’re famous for winning ‘six Victoria Crosses before breakfast’ in the First World War landings in Gallipoli, Turkey. Two of the VC medals are on display in the museum. A GMP spokeswoman said inquiries were ongoing.